Indian Air Force. The IAF has notified that the existing process of direct induction for men and women was through AFCAT. Also, NCC special entry for “C” Certificate holder was only for the male candidates. Now for the first time in the IAF, special entry for women (NCC Cadets) in Flying branch (SSC) has been initiated. Indian Airforce has initiated the online processing of applications for men and women cadets of NCC having Air Wing Senior division ‘C’ certificate. All the candidates who have cleared NCC ‘C’ certificate exam but not in possession of ‘C’ certificate to obtain the bonafied certificate from CO of respective NCC Air Wing and upload the same during online registration. 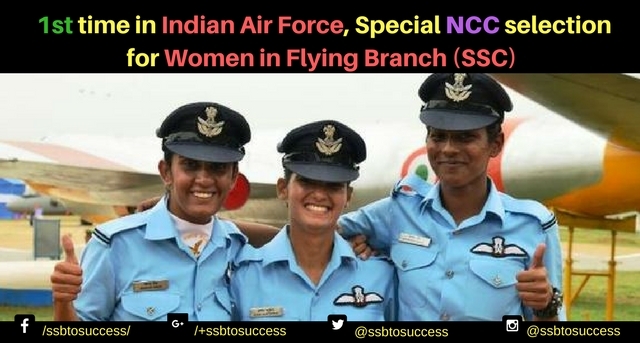 IAF stated that officers through NCC special entry for male cadets would be given Permanent commission (PC) & Short Service Commission (SSC) and women cadets would be for SSC in flying branch. Online Application will stat from 20 May 17. Registration will be closed on 15 Jun 17. NOTE: The detailed information about the notification will be published in Employment News dated 20 May 17.